When you look at pieces of armor and the like "in real life" they're usually adorned with all sorts of "things" that will help the people running that vehicle take care of various tasks. Spare tank treads, buckets, helmets and yes, tools. Plus, if that piece of armor has broken down "in the field" then those same people will need items to fix that vehicle and get it moving again. 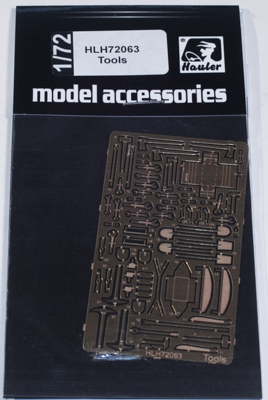 So if you're looking for tools to either "stow" on your armor model or have a diorama in mind with the people fixing the vehicle with tools scattered about, Hauler has you in mind. With this set you receive various wrenches, axes, shovels, hammers and even a couple of tool "boxes" to build to hold some of these items in. Yes, some are better represented with actual "3D pieces" (like the handle of a shovel, for example) so in those cases Hauler actually has you add your own piece of a round plastic "handle" to the photoetch shovel-blade. In other instances Hauler has you build a tool with multiple pieces; for example, they supply a couple of heavier hammers where the hammer-head is built up of three pieces, giving it a more "3D-like" appearance. 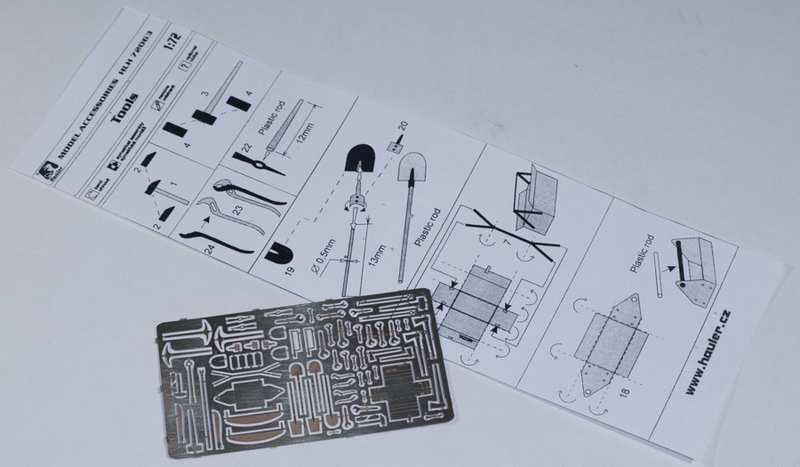 These tools can also be used on an airfield diorama because there are always these types of "things" scattered about an active "tarmac". My thanks to Brengun for sending these for review.